This section provides information about the best areas and types of properties for investment and the reasons why. 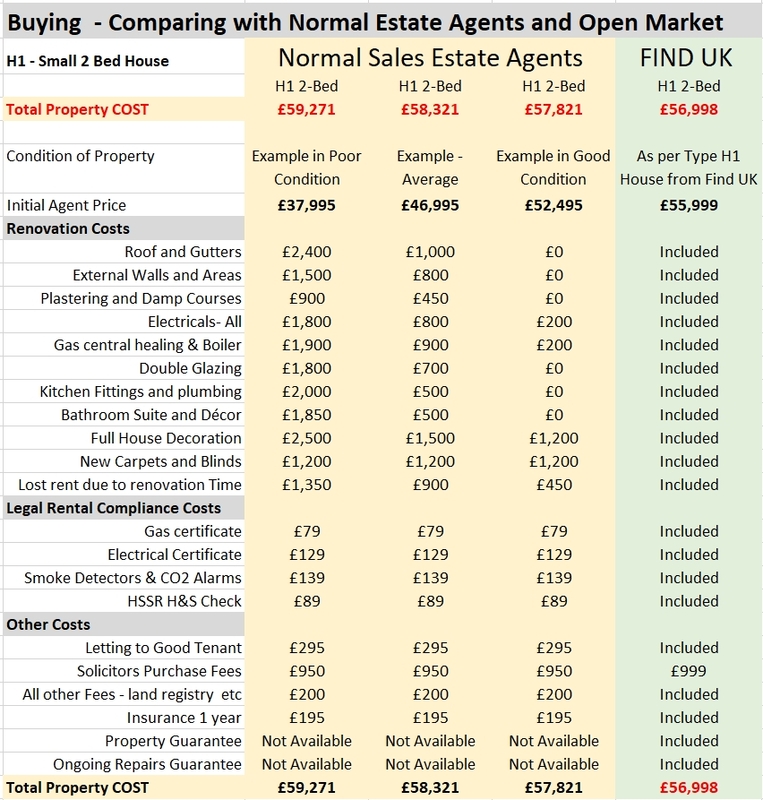 This section compares pricing for such houses in the market and the prices and services offered by other sales estate agents compared with Find UK Property. Whilst you may see a property in the open market at a lower price, when you factor for everything that is included in our package and compare like for like, you will find that our package price is the lowest cost overall. This section explains the rental demand outside of London and compares the likely net rental return over the next 10 years. It explains how net rent returns are dependent heavily on the quality of the letting agent and services provided. This covers historical property growth in the UK and summarizes the likely overall investment return and benefits over the next 10 years for investors using our service compared with other agents. This section compares different regions of the UK and explains why the South and London are no longer the best areas for property investment in the UK. -In the past Lancashire area has been depressed with high unemployment but now – over the past 10 years there has been very good recovery (unemployment has fallen from over 15% to 5% in some areas). 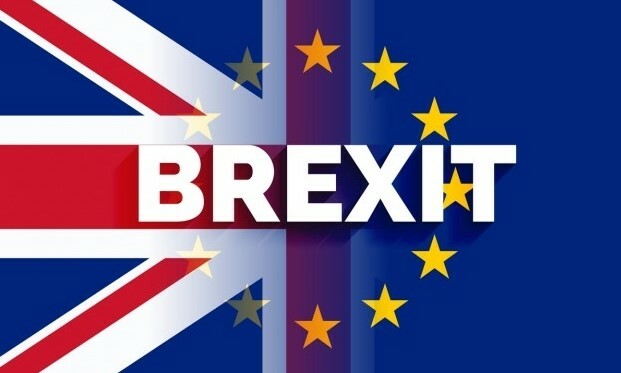 UK economy has moved from manufacturing to services and online, and many large companies have opened their call centres and logistics/service centres along the M65 motorway due to lower property costs and salaries. Overall Lancashire is expected to do very well. 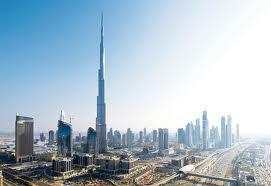 -The % capital growth on property here is expected to be better than the South over the next 10 years. On average terraced houses like this double in value every 9 to 10 years. After the financial crisis of 2007 to 2011, the growth is on schedule to exceed this average. -Rental demand is at the lower end of the market but is strong with a ‘culture’ of rental rather than buying. Over 35% of people rent and the preference is for houses and not apartments. -Due to general population and family growth in this area, demand for houses has increased and whilst there was plenty of supply in the past, now there are shortages. Recently many developers have started to build new houses on brown field sites and prices on older houses are also increasing. -The best yields are still provided by old lower cost terraced houses which still make up about 60% of the housing market in these areas. Over the past 10 years, we have identified 23 good neighbourhoods in the Lancashire towns and cities and we try to acquire all new houses in these ‘tried and tested areas’. -Investment return on property comes from both Capital Growth and Gross Rental Yield. Capital Growth in value in different areas of the UK is surprisingly very similar in % terms over the very long term e.g. 50 years – on average. However, there are variations in the medium to short term (London did very well in the past 10 years but the North is expected to do better in the next 10 years). Overall, on average, UK houses have doubled in capital value every 8 to 10 years for the past 100 years. Gross Rental Yield is the annual rent divided by the value of the property expressed as a percentage. Example – If you buy a property for £100,000 and get £8,000 rent per year. Then the gross rental yield is 8%. The map below shows the gross rental yields % on houses in different areas of the UK. Gross Rental Yield varies greatly depending on rental demand and property pricing in each area. You can see that the North West and North East of England deliver the best rental yields as property prices are still very low and the rental demand is strong. Find UK Property work “differently” to normal Estate Agents and Letting Agents. We provide a much more comprehensive service looking after all aspects of the purchase and the subsequent long-term management under a Guaranteed Rent System. This delivers overall better value and lower costs for our clients. Our clients get better value when they buy their properties from us. The chart below compares our lowest cost Type H1 property costing £55,999 that is fully renovated and rented out to a good tenant, with buying property in the open market from other agents and sellers. All properties in the open market will need some degree of work before they can be rented out. Low cost houses that are in poor condition (e.g. priced around £38,000 to £40,000) often need a lot more work (although they are the cheapest), and, can end up being more expensive as can be seen in the chart. Although there can be benefits in renovating a run-down expensive luxury property, the cost benefits of doing this with low-end properties for normal owners are low and can be negative (because labour costs are a big percentage of the property value). So, it is better to buy such properties fully renovated with guarantees. Unlike normal agents we buy the properties first ourselves. Then we renovate them fully at our own costs to a good standard and categorise them according to their value and investment potential. Within each category the houses are very similar. We ensure all houses are compliant with all the legal rental requirements and then we rent them out to good tenants who will live in the properties for a long time and look after them. Due to our buying power and use of our own staff to renovate and rent out, we can make overall savings. This means that we can make a profit whilst still delivering great value for money to our clients. See the examples below in the chart. Whilst you may see a property in the open market at a lower price, you need to factor for everything that is included in our package and compare like for like. When you do this, you will find out as per the examples shown that our total package price is lower. Also note that when you buy from the “open market”, you do not get guarantees with the property or ongoing repair guarantees. When you buy from us you do get these. If you use contractors for the renovation yourself then they may charge you even more than the prices shown in the table and you will need to monitor the work yourself to ensure it meets the standards. In example one, a property purchased in poor condition for a low price such as £35,000 from the open market will need a lot of money to be spent on it before it can be rented out. You will need to renovate it fully, make it legally compliant and then rent out to a good long term tenant. The total costs of doing this would be a lot more than our price (that includes everything). Rental demand in Lancashire is strong but is at the lower end of the market. Such tenants need to be supported and managed well. Our clients get better value when they keep their rental management with us under the Guaranteed Rent System. 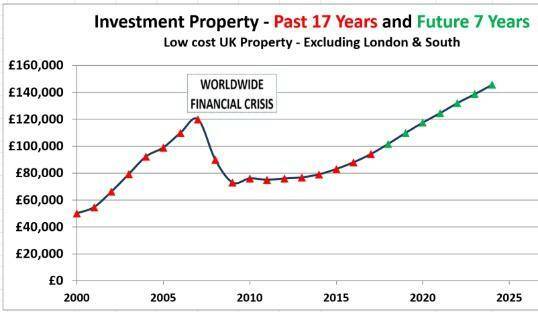 The chart below compares 10 Years of letting with Find UK Property and Standard Letting Agents. We have shown 3 types of Letting agents with various standards of management (Poor, Average and Good). This chart assumes rents remain static for all (although we would expect it to grow). In example 1, using a poor letting agent could mean that property is vacant for long periods or is let out to a bad tenant that damages the property or does not pay the rent. Furthermore, there may be poor maintenance of the property and ongoing repairs costs could be very high. The related costs would reduce your net rental income significantly. In our system, we we actively minimise these issues that could increase costs as we operate a Guaranteed Rent system. The way we work to manage and look after these properties ensures that overall costs are kept low as we do everything ourselves and treat these properties like our own. Because we renovate properties well up-front, the cost of maintenance and repairs to us is low, but the value to our clients is very high. This means that we can make a profit on the lettings service whilst still delivering great value to our customers. 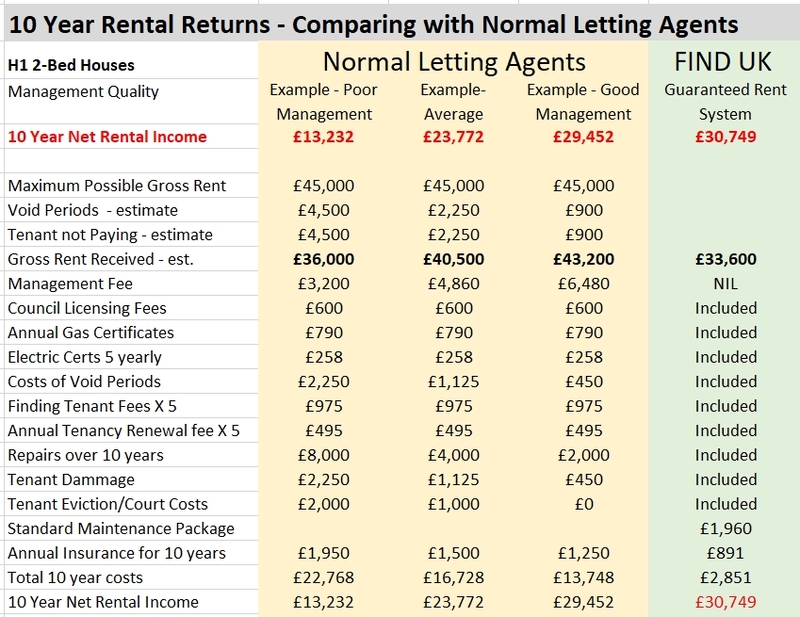 The chart above compares our pricing, product and service with normal letting agents. Overall, our clients get better rental income and greater peace of mind. Capital growth is hard to forecast but on average these types of houses have doubled in value every 10 years over the past 60 years. The only exception was 2007-2011 when they fell in price following the worldwide financial crisis. In the example below, we have assumed all houses would double in value over 10 years and give a capital return of at least £50,000. This is a reasonable forecast and is not excessive. The total investment return plus rental income return is also shown. You can see that overall, low-cost property gives good annual returns on investment. It is more secure and gives better returns than anything else you can invest in. Even with poor management you still get good returns of over 10% annually. Find UK and Good Management with any other good letting agent are expected to deliver returns of over 15% annually on such houses in the long term. Our clients find that there are other benefits with Find UK that are difficult to cost and price up. We have listed some of these here in this section. Clients normally remain under our Guaranteed Rent system – even after the minimum 2 years, as the Guaranteed Rent System can be renewed on an annual basis. Thus, clients continue to benefit from certainty of income and can plan their life confidently. We take authority from you to become the Landlord whilst you remain the Owner. This means that we can deal with all issues relating to the responsibilities of the Landlord. Normal letting and management agents do not do this, and you will still need to be involved if there are any legal issues with the property, tenant or authorities. With our service, we take care of everything – so you do not need to worry about any of this. You can get on with your work or your retirement – in peace. A normal letting agent would need to contact the owner constantly if there are issues with repairs, maintenance, rent or damage by the tenant etc. We do not do this – we just fix the problems like it was our own property at no cost to you. You will not need to field any calls from the local authorities or other bodies – everything is dealt by us. Our package gives overall peace of mind. This is difficult to price. For a lot of our existing clients this is priceless. 5. How do Property Agents and Find UK make a Profit? The trading model used by standard property agents and management companies is based on increasing the costs to the owner – as their profits are partly linked with this. They make more money with increased maintenance costs and property re-lets. Our model is based on treating these properties “like our own” and minimising the costs to us and to the owners. We achieve this by ensuring tenants are supported well and stay in our properties for the long term. We buy well and at a lower price than the market – many of our properties are purchased direct from sellers, before they go to an Estate Agent. We regularly door-drop leaflets in every house in 23 “tried and tested” key areas of Lancashire encouraging sellers to sell directly to us quickly and for immediate cash payment. This saves the seller on agent costs, allows them to sell quickly and means we can buy cheaper. Then we renovate properties fully ourselves, make sure they are complaint, and then rent them out. Due to our buying power and use of our own staff to renovate and rent out, we can make overall savings. This means that we can make a profit whilst still delivering great value for money to our clients. If we do our job well in getting good tenants and keeping the properties rented out all the time, we can achieve higher rents than we guarantee. Thus, we can make a profit on the net guaranteed rent. Last year, our average Net yield on over 880 properties was in excess of 6% and under 7%. Normally, we save the higher yield into the contingency fund in case of future requirements – rather than taking it as profit. We do not have to spend time and administration costs in constant liaison with owners as we can take all decisions regarding tenant and property maintenance ourselves. We do not need to do unnecessary repairs – just repairs to keep property in a good condition. Other letting agents make a commission on the repairs they do on your behalf – so it is in their interest to increase the repairs costs – even doing repairs that are not needed. It is in our interest to keep these costs to a minimum. We do this job well ensuring the property is well maintained, always rented out and fully compliant. We have qualified electricians, gas safety staff and HSSR qualified inspection staff. So, we can do all of these compliance items ourselves rather than using external contractors at extra cost. Most of our business comes from referrals and repeat business. Thus we have very low marketing costs. We only do a little bit of internet marketing – that is all. Thus our view is that sub £100,000 properties (away from London) are the best for investment as they not only deliver the best rental but are now also expected to grow the most in terms of capital value. You can see that for the same size and specification of property, prices in the North West near Manchester are much lower and rental yields are much higher. For the same price of a 2-bed terraced property near London you can purchase FOUR such properties in Lancashire and get more rent, better forecast capital growth and more flexibility. These properties are in the North West where property prices are depressed and future capital growth is likely to be strong. These include Manchester and Lancashire Towns. This is the most popular area for our investors. These properties are around Heathrow, extending from Slough along the M4 Corridor to West London. Rental demand and rental yields are better than other areas of London and future capital growth will be helped by the Cross-Rail Link which is under construction. Property in central London is too high to even consider. These are the popular English Towns like Oxford, Cambridge, Canterbury, Bath etc. These locations are good for own use property – not investment. Prices are similar to West London and rental yields are lower. North West properties are less than 25% of the price of West London and Southern Towns for similar type and size of property. Rental yields are almost double in the North West as property values are low. Demand for rental property is high. Rental yields decrease as property price increases and this trend applies to ALL areas. The smallest properties are the best for investment. Terraced properties are lower cost and give better rental returns than semi-detached and detached, which are popular for own use. These are the reasons why our best-selling investment properties are 2-bed to 3-bed terraced houses for around £55,000 to £70,000. If your budget is larger, buy multiple low cost properties. This is better than buying a more expensive property in London or buying more expensive detached/semi-detached properties. 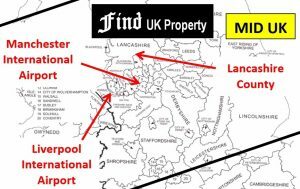 Find UK Property have divided the UK into 3 main Regions. This is the best value region for overseas buyers looking for any property in the UK. 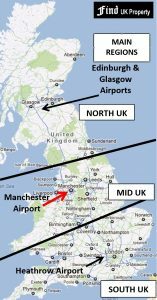 The region is centered by Manchester International Airport which is second largest to London Heathrow and amongst the top 10 international airports in Europe. 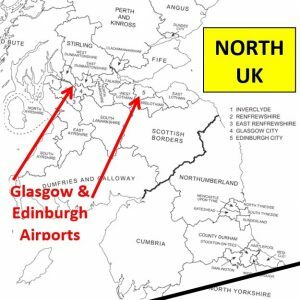 There is also International Airports at Birmingham and Liverpool in this region. It encompasses the areas of the North West, Yorkshire, East Midlands, West Midlands and most of Wales. A popular region for low cost investment properties with high rental yields is the region north of Manchester Airport including Lancashire. This region includes the South East, South West, East Anglia, Greater London and Inner London. It accounts for about 50% of sales of luxury detached UK properties. Properties in London are the most expensive, but there are relatively few large detached properties in London. Most of the London properties over £ 750,000 are in-fact apartments and terraced houses. Within this region, the South East is the most popular for sales of detached luxury UK properties and prices here are about 70% more expensive than in MID UK. The main airport serving this region is London Heathrow Airport. There are also other airports nearby including Gatwick, Stanstead and Luton. 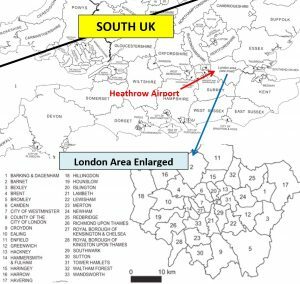 The region around Heathrow Airport including West London/ Slough area is also a very popular region for investment properties with high rental yields. We no longer recommend investment properties in or anywhere near London or the South as the prices there are very high and the % rental yields are too low. The same property which we sell for £60,000 here in Mid UK Region is over £300,000 in the South. In the past London has done very well in capital growth – however this is less likely to be the case going forward and the risks of buying here are ow higher. Many clients just RENT near London (if they have to be near London for holidays or work) but they BUY multiple low cost investment properties away from London as this gives higher income now, and better potential for the future with lower risks. This includes Northern England and Scotland and accounts for less than 10% of the property market. However prices are lowest here and large country estates can be purchased for little more than 1m. Get free advice on your needs from an experienced property specialist. Simply click here and complete the email and enquiry form and we will arrange for one of our senior staff to call you and discuss your requirements. They will listen to you to understand your current and long term needs. They will answer all of your questions in full, and just give you the most appropriate advice – they will not try to sell to you. Our sister company in the Group, “Openshore Property” helps buyers from all over the world find good low cost investment property in Dubai. We are fully licensed members of the National Association of Estate Agents. NFoPP – National Federation of Property Professionals Award Winner amongst all UK Estate Agents in 2012. Low cost property prices are now rising in the UK. 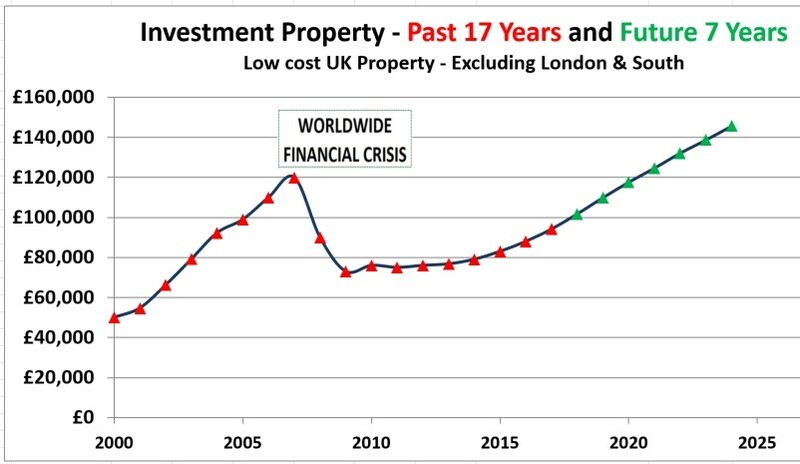 Prices for low cost properties away from London (under £100,000)– traditionally the best for rental yields fell from 2007 to 2010 due to worldwide financial crisis. These are now rising in line with economic recovery. Historically, on average, property prices have doubled in value every 8 to 10 years for the past 60 years. Whilst no-one can predict the future, our expectation is that the previous trend will continue and prices are expected to more than double in the next 8 to 10 years. Gross Rental Yield is the total annual rent divided by the value of the property expressed as a percentage. Example – If you buy a property for £100,000 and get £8,000 rent per year. Then the gross rental yield is 8%. The map below shows the gross rental yields % on houses in different areas of the UK. Gross Rental Yield varies greatly depending on rental demand and property pricing in each area. You can see that the North West and North East of England deliver the best gross rental yields as property prices are still very low. We specialise in the Lancashire areas of the North West where house prices are low and the gross yields are the highest. What is the process for Buying Property in the UK? What are the additional costs involved in UK Property Purchase? What are now the best locations for investment property? Who can be classified as UK Non-Resident for Tax Purposes? Should I buy houses (freehold) or Apartments (mainly leasehold) ? Full houses are better for long term investment as most apartments and student pods tend to be leasehold and do not grow in capital value over the long term. Student pods, hotel rooms, rooms in residential homes, and serviced apartments are difficult to resell as they can only be resold to another investor. The UK is one of the World’s most secure and regulated places to buy property. See our UK property Buying Process section that covers the UK property buying procedure and why the UK is a very secure place to purchase property for own use or for investment. Around half of our clients are UK nationals living abroad (expats).Others are busy professionals from London and the South or are overseas nationals from all over the world including USA, Europe, Australia, Middle East, China, Africa, Canada, India and South Asia. Please click the brochure link or complete the Contact Us page for further information. The Trading Standards Institute has approved the code of practice we follow, which is run by The Property Ombudsman. Where a business displays this logo, customers can have the confidence of knowing that they will be dealing with a company that has undertaken to treat them fairly if problems arise, and deliver customer service standards that go beyond minimum legal requirements. Our staff are fully trained and hold as a minimum the Award in Residential Property Sales from NFOPP – The National Federation of Property Professionals. We are a fully licensed member of the NAEA – National Association of Estate Agents. Our License Number is M0189573. Many overseas buyers have links with the UK and wish to invest in the UK for a wide range of reasons (pure investment for income and growth, holiday use, university accommodation for their children. Long term security of assets, future pure own use for retirement, or simply to give themselves options for the future.) Almost in all cases it is best to acquire one or more pure investment properties that grow in value, give good income now and offer flexible options for the future. Leave your own property rented out all of the time and keep the rental income in the UK and use this rental income to pay for your holidays, children’s studies or rented accommodation for your own use. The investment property can then be purchased for the best yields, price and investment returns – and not necessarily in areas you need to live in (which are often near London or the South). Find UK Property specialize in low cost investment properties in the UK. Our clients include Overseas Nationals, UK Expats living abroad and UK Residents mainly from London and the South. We work differently to normal Estate Agents and Letting Agents and provide a much more comprehensive service looking after all aspects of the property purchase and the subsequent long term management.